In July of 2014, the RMR sent a contingent of soldiers to take part in the Annual Nijmegen Marches. Held in the Netherlands, “the Four Days Marches” is a rigorous and prestigious event in which Canadians have participated since 1952. 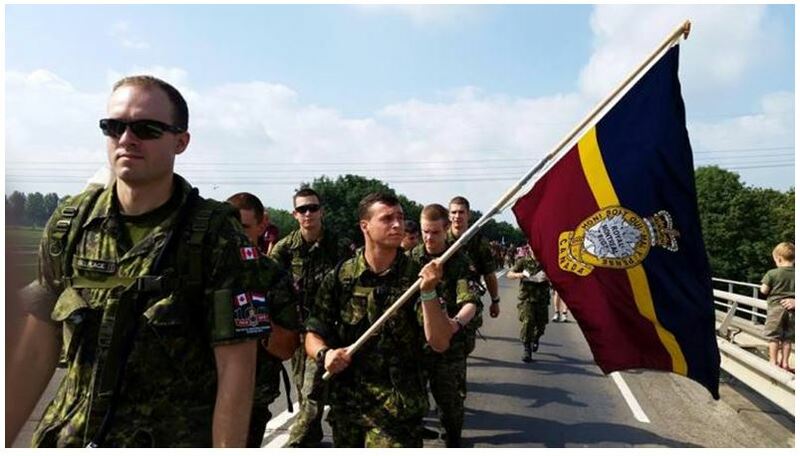 It has continued to grow over time, and today includes foreign military personnel from 50 different nations as well as up to 46,000 civilian participants marching 160 km over four days. This year’s Nijmegen Marches held a special significance as nations the world over commemorate the outbreak of the First World War, and the RMR celebrates its Centennial anniversary. An 11-man team (including an attached medic) was assembled under the leadership of Captain (Capt) Paul Delplace and Warrant Officer (WO) Kevin Langlois. Throughout the spring and early summer months of 2014, Capt Delplace and WO Langlois maintained a rigorous but methodical training plan that built up their team’s endurance for the challenges of the March itself. Rain or shine, hot or cold, the RMR’s Nijmegen Team marched several times a week using various routes through the city of Montreal in preparation for their expedition. In mid-June the Team members marched from CFB Valcartier to the Port of Quebec in celebration of the 100th Anniversary of Camp Valcartier’s inauguration, and were declared “Operationally Ready” for the Nijmegan March. Finally, in mid-July, they boarded flights to Europe. The Royal Montreal Regiment 2014 Nijmegen Team at the Canadian National Vimy Memorial (from left to right): Cpl Schneider, Pte Andrews-Jackson, Cpl De Chantal-Thivierge, Capt Delplace, Cpl Gomola, Cpl David, Cpl Deraspe, MCpl Parnell, WO Langlois, Sgt El-Khoury, Cpl McLeod. – On July 12, the Canadian contingent visited and held memorial ceremonies at the Canadian National Vimy Memorial in Arras, France; the Langemark German War Cemetary in Langemark, Belgium; the Essex Farm Cemetery; and the Menin Gate Memorial to the Missing in Ypres, Belgium. – On July 15, the Nijmegen March began. – On July 17, halfway through the day’s marching, the Canadian soldiers paid their respects at the Groesbeek Canadian War Cemetery, the final resting place of more than 2,300 Canadian soldiers and airmen who died fighting to liberate the Netherlands in 1944 and 1945. – On July 18, the last day of the Nijmegen March, the RMR’s team members were awarded the Four Day Marches Cross for completing the Nijmegen March. 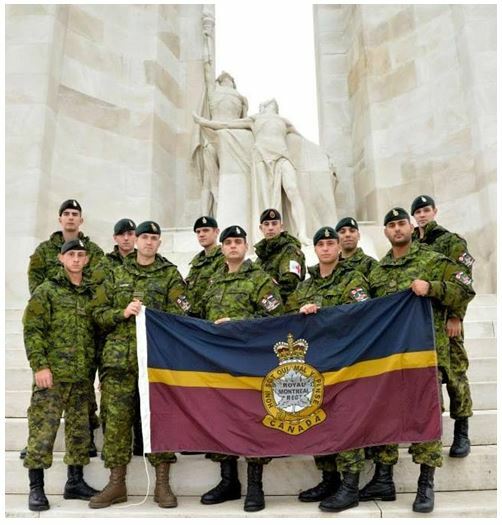 After marching over 1,000 kilometers, overcoming fatigue and pain, commemorating the sacrifices of Canadians in the World Wars, and serving as ambassadors of the RMR with honour and pride, we salute the RMR Nijmegen Team of 2014 for its exemplary dedication, leadership, and bravery. To watch a video about the RMR Team’s preparations, click here.